1. In a large bowl, add all salad ingredients except feta cheese. Refrigerate until ready to serve. 2. In a small bowl, add dressing ingredients. Whisk together to blend well. Refrigerate until ready to toss. 3. To serve-toss dressing with salad. Divide among 4 plates. Top each with 2 tablespoons of feta cheese. 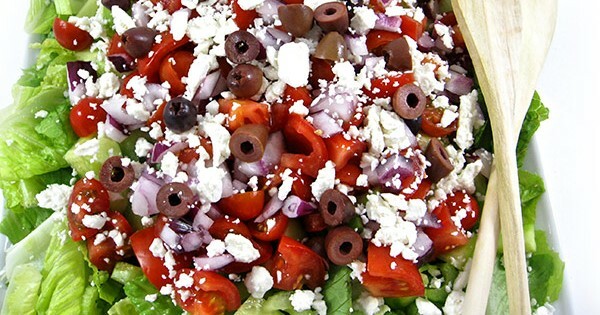 If you’re serving buffet style, add feta cheese to the salad before tossing.